Last year we were asked to look at The Varsity Center for the Arts renovation project. It looked fine from the ground and only had one leak on the inside, but the barrel part of the building was in desperate need of replacement. The old membrane had spider web cracks in every square foot. 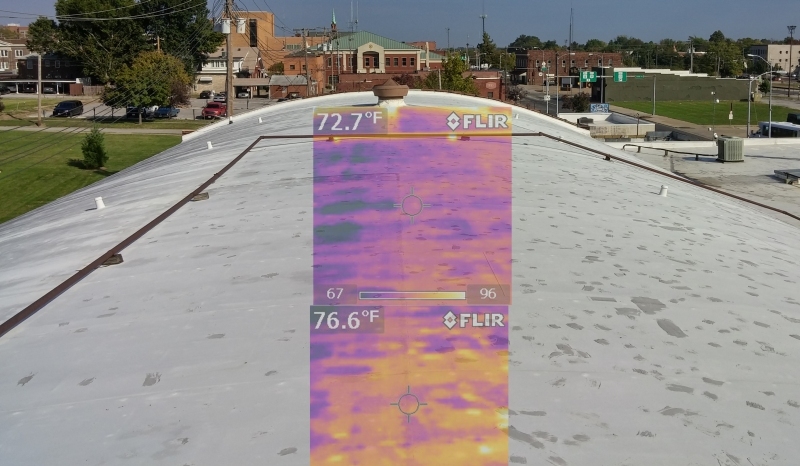 A coating would have been good about five years ago, but we were worried about the trapped moisture underneath so we performed a thermal imaging scan which revealed that the roof had to be torn off. Click here to see other projects! 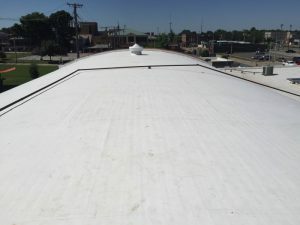 The old membrane was installed over an asphalt roof that had absorbed a ton of moisture, luckily the steel deck was still in good shape. The warranty on the old roof was 20 years and failed prematurely but it wasn’t caught until year 21. We tore off the roofing on the complete barrel(it was soaked) and installed new PolyISO insulation board with a fully adhered Genflex 60mil TPO thermoplastic membrane which has a 20 year manufacturer’s system warranty. Our crew had a heck of time battling one of the wettest and windiest months we’ve had. We waited all spring and finally pulled the trigger during a dry spell. Half way through the project, the winds picked up making it very difficult to adhere these 10′ wide x 64′ length sheets. When the sheets were laid, we used an automatic heat welder to seam the sheets together making this one monolithic membrane. TPO membranes have heat welded seams that are permanent and are actually stronger there than in the field. EPDM(rubber) is a great product, but the seams are the weak link. TPO is also energy star rated and can be installed in conjunction with several layers of insulation providing a very tight green building envelope. We are glad the job is done, and very proud to have worked on the oldest theater in the Carbondale and Marion, IL area. Enjoy the show! Call (618)687-4824 to get a free quote on your project. 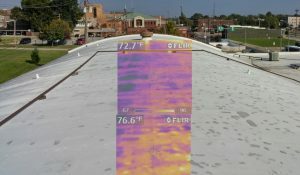 Carbondale, Marion, & Murphysboro’s trusted commercial roofing contractor !